EverWebinar vs WebinarJam – Which One Should You Use? When I first heard about Everwebinar, I naturally came across WebinarJam as well. They are both products owned by the same company. So if you’re confused which one you should use, keep reading – cause this is the EverWebinar vs WebinarJam battle. The core technology between both these webinar solutions is the same. Both of them are promoted by the same marketer: Andy Jenkins. The only major difference between these two is the WAY you publish your webinars. In fact, the login screen for both these platforms is the SAME. Not just that, but the interface is pretty familiar too. The quick screen tabs on the left of your console are the SAME. The reporting and analytics is pretty much the same. The only difference being the FILTERS you can choose to view your reporting will change. WebinarJam: Your visitors will only be able to select the LIVE webinar timings that you’ve configured inside WebinarJam campaign. Which – when expired… will… well… expire. EverWebinar: Your visitors will be able to choose a date and time in the future based on your EverWebinar campaign settings. You can even enable their ‘Just in Time’ setting to let your visitors choose a webinar time slot within the hour. 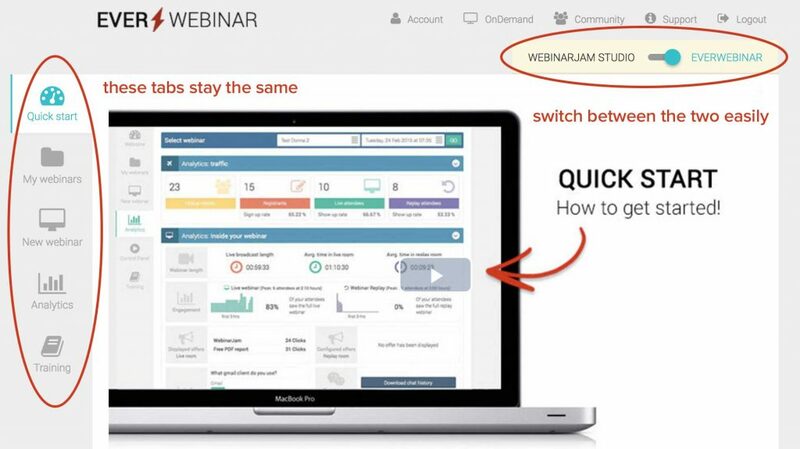 Do you need EverWebinar to use WebinarJam & vice-versa? Even though these two platforms are so similar – you don’t need BOTH of them. They are independent and mutually exclusive. You CAN use both of them if you run both live and automated webinars. If you’re just interesting in hosting live webinars – use WebinarJam. if you’re interested in hosting automated evergreen webinars – use EverWebinar. Once you have your webinar PPT nailed down, and your web-reg optin page ready, create your webinar campaign using WebinarJam and get your funnel live. You can use Youtube LIVE streaming along with their JamSession technology for conducting your webinar. But yes, you will need to be there live and host that webinar manually. Setting up a new WebinarJam webinar is pretty easy – especially if you’ve done it before. You can easily clone your old webinar, retain most of it’s settings (including integration with your autoresponder, emails etc. ), and simply change the date and time to publish your new webinar. You CAN use recorded webinars for your WebinarJam webinar – but you need some tech integration to figure out a system to play a recorded video as your YouTube live stream. Once you have a webinar that converts well, simply use the recorded version of that webinar from WebinarJam, upload it to a cloud video service – Youtube works too. Then take that link of the webinar video, and publish it into your EverWebinar campaign. You can read more about the process in my EverWebinar review. You can pretty much have any video as the source of your webinar – it doesn’t necessarily have to be a recorded WebinarJam video. That’s the basic crux of it. Creating an Everwebinar campaign does take a little bit of time, which includes setting up your Everwebinar emails and setting up time slots, registration settings etc. But once you’ve completed the configuration process, simply take their registration button code, paste it on your web-reg page and you’re good to go. Your visitors will be able to choose a time slot and get their notifications. ‘Fake live’ webinar and replay webinar will be shown to them based on their chosen date and time. Your automated evergreen webinar will keep working day and night – so all you need to do is focus on driving leads through your web-reg page. Here’s a quick summary table to make sure you understand which one is better for your webinar. 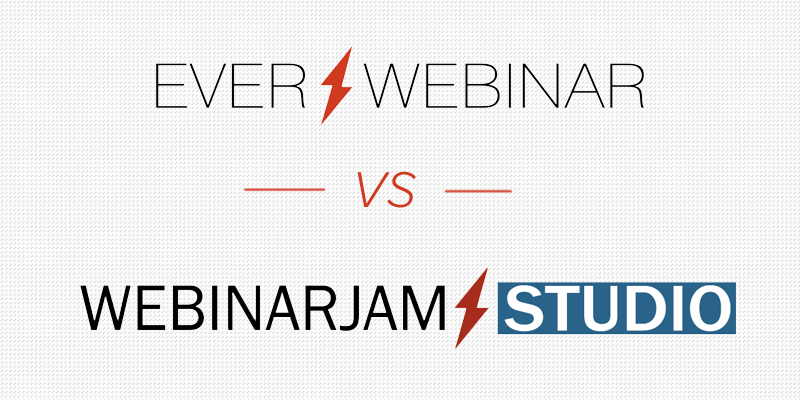 EverWebinar vs WebinarJam – Let the battle begin. If you liked my Everwebinar vs WebinarJam comparison and made up your mind on which one to use – let me know in the comments below which one you chose. I still dont get it . I want to create the live effect, but it seems to do this i need the webinarjam and then place it on everwebinarto have the effect its live? So therefor i need both? , which then takes it into being the same cost as other platforms? The other issue is i am in Australia, the only communication is via email, there is no allowance for different times world wide for help, via chat or phone. The phone cost $150 per hour, its steep for someone wanting to purchase the platform. I would have liked to use the platform , yet after a free trial and not being able to time the communication , I have lost the trial, only in the last week did I receive a email saying they would get someone to call me , yet here we are a week later , my trial is finished and still trying to arrange a call. Please try getting in touch with their support another time.